Dr. Sue Clifton was born in the middle of Interstate Highway 55, northbound, in the fast lane. Her life began in the fast lane and she's been speeding in everything she's thought and done since. However, at the time she was born, the spot where I-55 would later dissect her life was nothing more than a ram-shackled, brick-siding house with no indoor plumbing in rural north Mississippi. By the time Dr. Sue entered first grade, her family had progressed with indoor plumbing and a new invention called a television that had a small round screen. Though the economics were the same for all the children at school, Dr. Sue Clifton was not like other little girls. She climbed gullies, wore cowboy boots with her dresses to school, and wrote her own series of Nancy Drew type mysteries by the time she was in fourth grade. Her passion was writing, and at sixteen, she had two plays published by Progressive Farmer Magazine, the only magazine she knew anything about. As an adult, Dr. Sue's passion for writing was put on hold while she pursued a new passion, education. After receiving several degrees in education, she worked as a teacher and administrator in Canada, New Zealand, and on the Northern Cheyenne Reservation in Montana but spent most of her years as a principal in Mississippi and Alaska. 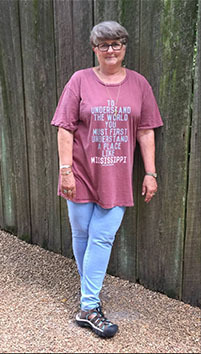 After retiring from the field of education, Dr. Sue Clifton set to work on her neglected passion and won many first place awards at writers’ conferences. In 2009, she fulfilled the last of the three lifelong goals she had set for herself when her first novel was published. Now retired, Dr. Sue Clifton lives in Mississippi, Arkansas, and Montana and is able to write full time, except for the time she spends traveling, hiking, and fly fishing with her husband Woody and their grandchildren. The unique places where Dr. Sue has lived provide rich background for the characters created in her novels. Another of her favorite pastimes is “ghost hunting”, and she travels all over the country conducting paranormal investigations at haunted locations. (See YouTube links to Dr. Sue’s most eerie paranormal investigations in the “Adventures” section of her website. Prepare to be amazed). Note: Dr. Sue Clifton and Sara Dulaney Pugh (Angel Leigh) can be seen in the five-part series CURSED: THE BELL WITCH, available on A & E. Watch parts 4 and 5.